I’ve had some reader questions about when we’ll be getting new installments in various series and what I’m working on. So, here’s an update on what I know about now. Of course, it’s subject to change, based on inspiration and reality. I would like to find a publisher for my young adult books. Those don’t seem to sell as well as independently published books, and school visits and library visits are a little easier to get with books from traditional publishers. So, I’m working on a new concept for a potential YA series, and because I want it to be a book that has publishers getting excited enough to actually remember that they’re publishing it, I’m taking the time to make sure it’s just right. So that’s getting the bulk of my writing time right now. I’m also working on a fun little treat for the holiday season. I love those made-for-TV Christmas movies, particularly the ones with little fantasy elements. A few years ago, I wrote a screenplay for one. I figured that romantic comedy with some magic in it was right up my alley. But selling a screenplay is kind of an ordeal, and I wasn’t even sure how to start. I did love this story, though, so I’m turning it into a holiday novella that should be coming out sometime in November. It’s not related to any of my other series, but maybe it’ll be just the thing if you want a light, shortish romantic comedy read with a touch of magic and some holiday spirit. Stay tuned for specific release date, title, etc. I’ve got a new Enchanted Universe short piece coming out August 15. It’s another Sam story, but this one is a direct prequel to Enchanted, Inc., giving some insight into what was going on with the magical people before Katie became aware of the magical world. I also have a rough outline for a ninth Enchanted, Inc. novel that I hope to start writing when I finish that YA book. We’re looking at a tentative release date in March of next year, but I haven’t written a word of it, so this is all subject to change. There will be a fourth Rebels book. I have some general ideas for it, and I think that will be my fall writing project after I finish the Enchanted, Inc. book, which means a release maybe in late spring or early summer, depending on how long it takes me to write it. I do want to write more books in this series, since I haven’t finished all the character stories I want to tell. But these don’t sell quite as well as my other books and are much more difficult to write. I’m thinking of trying a new approach with them, but at the moment I don’t have a firm plot in mind. I’m hoping something will come to me by the time I finish these next two books so I can do more. I really love this series, but the effort/reward equation is so out of whack that they tend to fall lower on the priority list. Since I do this for a living, I need to focus on work that will earn money. If you love this series, you can help change that by telling people about these books, reviewing them on the various retailer sites, etc. Meanwhile, I have a lot of other ideas I want to play with but that I’m not ready to talk about. So I guess I’d better get to work so I can get all these ideas written before I get even more ideas. 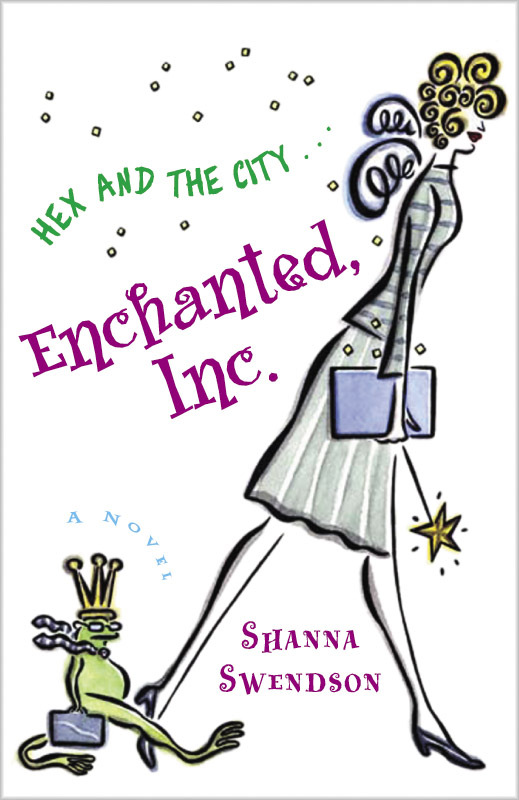 Hi Shanna, I am currently inhaling the Enchanted, Inc. series (I started the first one around Memorial Day and will be on to Frogs and Kisses on Monday when my husband goes out of town again) and I would love to jump into more of your books. I have looked at the fairy tale series but I can’t tell if it’s YA or intended for the same audience as Enchanted. The covers make me think YA but I thought I would ask, just in case. Thanks! The Fairy Tale books are aimed at about the same audience as the Enchanted, Inc. books — if anything, slightly older, as the main characters are older. But, really, I think all my books are suitable for the same audience, from teens to adults. The “YA” is just a marketing label on the Rebels books (I originally wrote the first one as an adult book, but the main character was young, and it ended up selling as YA). I love these kind of short books. On another note, I just finished reading….well listening…to Rebel Mechanics. Good book and I love the originality of it. I want to move on to the next 2 in the series, but as a single, working mother of 3 kids I don’t have too much time to sit down with a book. So my question is, do you have any plans of releasing the other Rebels books on Audible? I’ll read them regardless, it’ll just take me some time to get to them lol. I would like to do the other books in audio, but the audio publisher hasn’t yet signed on for it. I hope to have Rebels 4 out this year, but I don’t have a set date on it because I’m still researching and planning it.